Drawing on almost four decades experience in the industry, Anderson Air is a Vancouver, BC based company providing Executive Charters and Aircraft Management Services. We profile the company to gain an insight into how it has enhanced its offering over the past 39 years to ensure it remains a key player in Canada’s aviation industry. Since its inception in 1980, Anderson Air has been a family-owned and operated business dedicated to providing Aircraft Management services. In addition, the company provides convenient and cost-effective private and corporate/executive charter services throughout North America, Europe and South America. Aircraft acquisition, aircraft partnerships and maintenance services round out its service offerings. 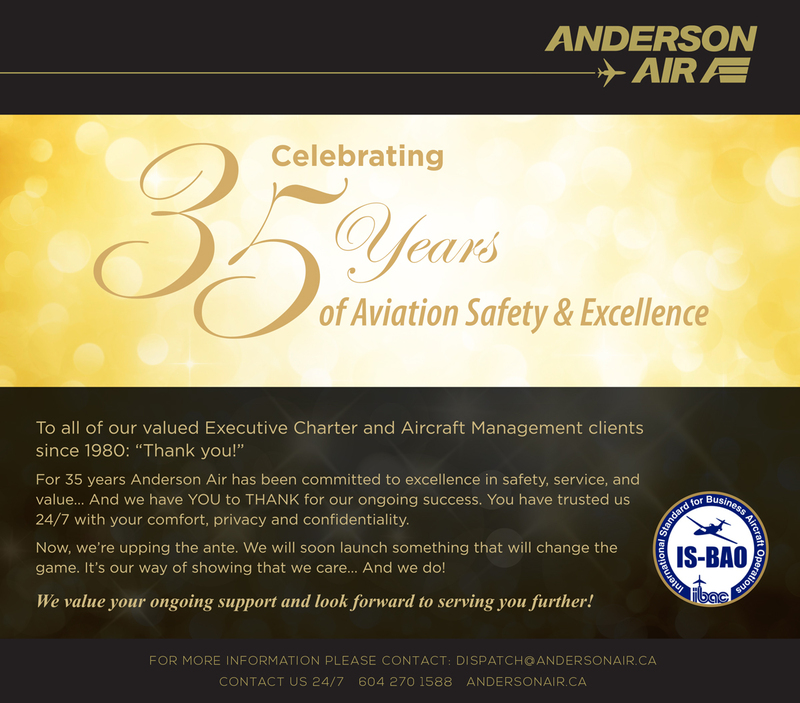 As the oldest aircraft management and charter company based in Vancouver BC, Anderson Air has deep roots in the aviation and business community spanning for over 39 years. Its sister company, the Oppenheimer Group, the oldest operating company in BC has been in business for over 160 years. The team at Anderson Air take great pride in its safety record of over 39 years of safe operations, with zero Transportation Safety Board incidents or accidents. This exceptional safety record gives the firm’s clients tremendous confidence and security in choosing Anderson Air. 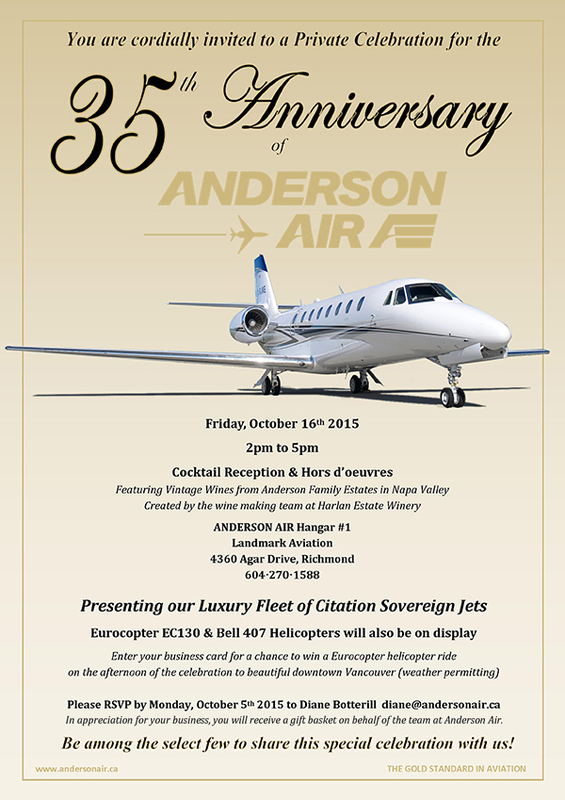 Another key source of pride for Anderson Air is its high attention to detail. The firm’s experienced team can tailor departure times to suit tight schedules, plan itineraries and undertake due diligence with respect to anticipating the needs of their valued clients; Thus ensuring they arrive at their destination on time and on budget. Anderson Air’s core purpose is to deliver customized Jet Charter and Aircraft Management services to ensure all clients feel like they are an owner of one of the best jets in an exceptional fleet. Drawing upon the company’s core strength of its higher standard of safety, people, service and aircraft type, its clients can rest assure that they are getting only the best possible service when they work with this innovative and dynamic company. As part of its people-focused approach, Anderson Air works hard to give back to other family-based charities including Ronald McDonald House, BC Children’s Hospital foundation, Lions Gate Hospital foundation, Canadian Cancer Society and the Family Services of the North Shore. By working to support the wider Vancouver community, the firm is able to cement its position as a local business dedicated to supporting local people. Operating within a fast-paced and constantly evolving market, Anderson Air is constantly improving upon its systems and processes to drive operational efficiencies which help deliver upon its continued success. Annually, Anderson Air undergoes Strategic Planning to ensure its products and services are fine-tuned while ensuring its business plan is sound and relevant to its clients. As part of this focus, the company has recently added 2 Dassault Falcon 2000LXs to its fleet of 3 Citation Sovereigns. In addition, completed initiatives including new flight operations software, upgrading the current safety management system and IT systems including the development of smart phone and tablet apps allowing its team a wireless and paperless integration for its operations. Additionally, Anderson Air has a Quality Assurance Program, sets Safety Performance indicators (SPI’s) through the Safety Management System (SMS) and ensures its exceeding compliance with industry regulations. One of Anderson Air’s core values is to ensure safety is never compromised: It is top of mind in every activity, decision and service the company provides. To deliver on this value, Anderson Air undertakes yearly multiple internal and external audits achieving the coveted IS-BAO stage 2 safety certification. The final Stage 3 certification is in its sights with the goal of completion in the companies next audit cycle. 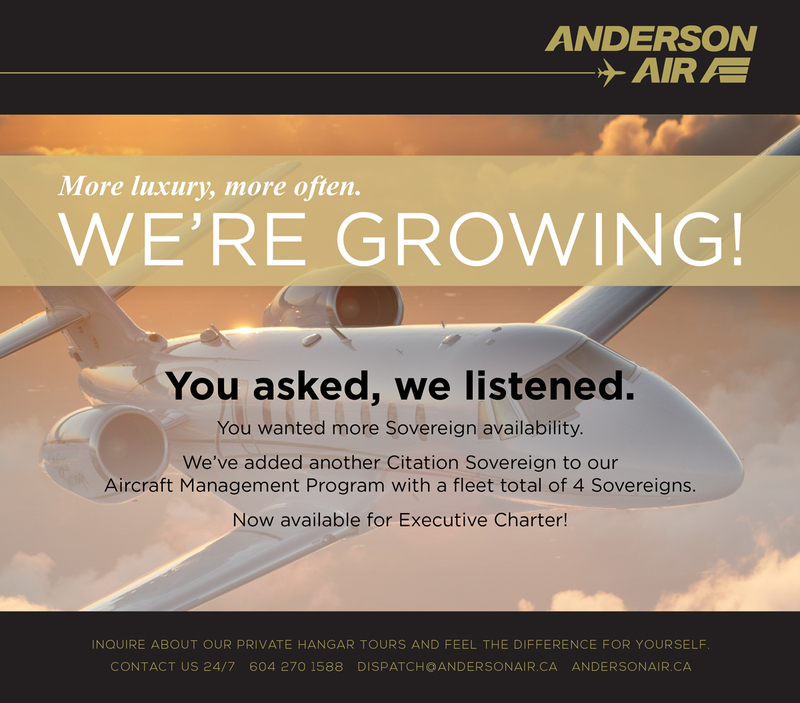 Ultimately, Anderson Air’s overriding goal is to be the premier executive charter and aircraft management company in Vancouver, BC. To achieve this, the firm continues to innovate and adapt around emerging market developments while providing a positive client experience. Over the coming years, the firm will remain steadfast to its 3 key Strategic Pillars: Dominate in client service, differentiate in its fleet, and compete/meet the market in price. These strategies will ensure that Anderson Air remains at the forefront of emerging developments within the ever-evolving private air transport space and is able to meet its clients’ ever-rising expectations. What makes a “best managed” company? According to the global financial services company Deloitte, companies with best-in-class business practices—like the Vancouver, BC-based Oppy—demonstrate exceptional strategy, capability, commitment, and return on investment. That’s why they have named the full-service fresh produce marketer and distributor among Canada’s Best Managed companies for the last 18 years, and welcomed Oppy to the program’s esteemed Platinum Club a dozen years ago. Anderson points to the expect the world from us promise of the Oppy brand as the thread that ties strategy and execution together at Oppy. Sponsored by Deloitte, CIBC, Canadian Business Magazine, Queen’s Smith School of Business, and the TMX Group, Canada’s Best Managed Companies program recognizes organizations that have implemented world class business practices and created value in innovative ways. The Platinum Club honors top-performing companies that earn a place among the best for six years or more. Oppy has been chosen every year since it first applied in 2001. Best Managed applications are reviewed annually by an independent judging panel that evaluates how companies address various business challenges, including new technologies, globalization, brand management, leadership, leveraging and developing core competencies, designing information systems and hiring the right talent to facilitate growth. The accolades announced today recognize Oppy’s 2018 achievements, including adding large scale value-added programs for kiwifruit and citrus in Western Canada, launching Frank & Able, a unique new brand of greenhouse tomatoes-on-the-vine, building the scope and scale of its Ocean Spray berry program, and developing high demand for Zespri SunGold kiwifruit. Oppy was also recently selected as one of BC’s Top Employers for the third consecutive year. The Oppenheimer Group has been selected once again among BC’s top 100 employers. Since BC enjoys the lowest unemployment rate of any Canadian province at 4.4 percent, being designated as one of BC’s Top Employers helps Oppy compete for the great talent it needs to maintain its strong, high-performing team. Top employers are evaluated on operations and culture, including physical workspace; work atmosphere and social activities; health, financial and family benefits; vacation and time off; employee communications; performance management; training and skills development, and community involvement. Oppy is in the esteemed company of BC Hydro, the University of British Columbia, Whistler Blackcomb, and none other than the Vancouver Canucks among the 2019 honorees. I would like to share some wonderful news with you all. 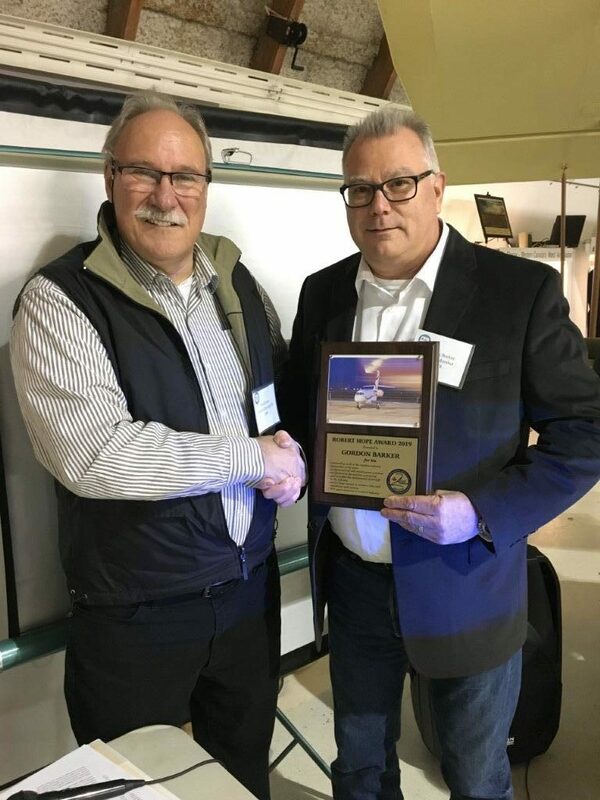 Recently at the Pacific AME Association Chapter awards ceremony, our very own Gordon Barker was the recipient of the 2019 Robert Hope Pursuit of Excellence award. This award was presented by Bob Rorison, retired President of the Pacific AME Association. The Robert Hope Pursuit of Excellence Award is presented each year to a recipient for their outstanding work in the aviation industry. The candidate must have 40+ years of service to the aviation industry, demonstrate mentorship to his peers, be involved in the aviation community and demonstrate professional and safe maintenance practices. Congratulations Gord on your achievement of this award. Very well deserved! At a gala event in Toronto March 1, one of greater Vancouver’s most celebrated executives was honored among Canada’s Most Admired CEOs. John Anderson, Oppy’s chairman, president and CEO, was chosen by Waterstone Human Capital and MacKay CEO Forums—leading Canadian executive development firms—from a field of company leaders working throughout Canada. He represents the program’s “Enterprise” category, for executives of companies that earn annual revenues of $1 billion or more. While the honor was announced last November, the awards ceremony, embedded in a corporate culture summit for company leaders and an exclusive CEO-only culture workshop, made it official. Anderson was specifically selected for fostering a winning culture at Oppy, the leading international fresh produce marketer and distribution company, that enhances performance and sustains a competitive advantage. Anderson credits the company’s success to the combination of its collaborative strategic planning process and a culture backed by Oppy’s expect the world from us promise, which he introduced about 15 years ago. As a result, Oppy—whose rich traditions and values have been preserved by Anderson as he progressed the company forward during his 43-year tenure—celebrates its 160th anniversary in this year. Oppy itself was recognized as having one of Canada’s Most Admired™ Corporate Cultures last year and will hold the designation through 2018. The company was also recently recognized as one of Canada’s Best Managed companies for the 17th year, with 11 years in the program’s esteemed Platinum Club. Anderson, meanwhile, has achieved numerous noteworthy honors, including most recently the 2014 Lifetime Achievement Award from the Chile America Chamber of Commerce, 2014 Business in Vancouver BC CEO Award, 2014 Acquisitions International Business Excellence Award, 2015 Ernst and Young Entrepreneur of the Year Award for Canada’s Pacific Region, among many others.